Keen's myotis. Photo by Bat Conservation International. 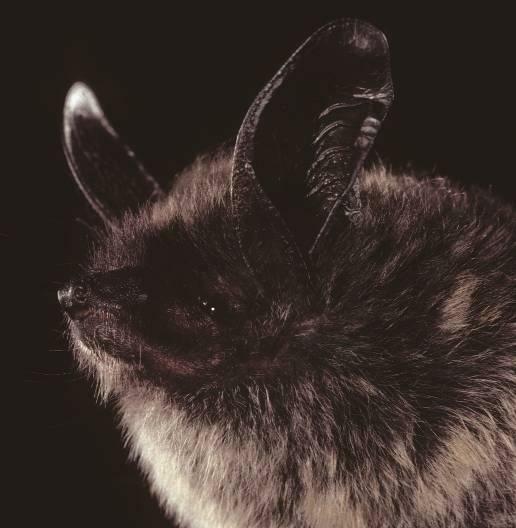 Keen’s myotis (Figure 1) is one of three similar long-eared Myotis species in Washington, making simple field identification impossible in western Washington and southwestern British Columbia (Burles and Nagorsen 2003). Keen’s myotis are largely restricted to moist coastal forests of lower elevations dominated by western hemlock, Sitka spruce, and other conifers, although a few records come from urban sites (Firman et al. 1993, Burles and Nagorsen 2003, Boland et al. 2009a). Keen’s myotis roost in caves, rock crevices, large trees, snags, and buildings (Burles and Nagorsen 2003, Boland et al. 2009a). Hibernacula are known to include mid-elevation caves. Keen’s myotis has one of the smallest distributions of any North American bat, occurring in coastal areas from southeast Alaska to the Olympic Peninsula, Puget Sound, and Mt. Rainier in Washington (Burles and Nagorsen 2003, Boland et al. 2009a; WDFW WSDM database). They have been reported in five counties in Washington (Figure 2). Population size and trends are unknown (NatureServe 2009). They are generally considered rare, but problems with field identification complicate efforts to assess populations. Low densities have been reported in British Columbia (Firman et al. 1993, Burles and Nagorsen 2003) and southeast Alaska (Boland et al. 2009b). No roosts of this species are currently known in Washington. The last confirmed detection in the state was in 2008. Threats or potential threats include loss and fragmentation of habitat caused by clearcutting of old-growth coastal forests and human development; disturbance of hibernacula and maternity sites through human visitation and logging road construction; predation by cats; and pesticide use in forests (Burles and Nagorsen 2003, NatureServe 2009). Surveys. Inventories and monitoring of bat populations in western Washington have not reported Keen’s myotis since 2008. These survey efforts have been conducted by various agencies, conservation organizations, and volunteers. Bat conservation plan. WDFW is preparing a conservation plan for bats in Washington (Hayes and Wiles, in prep. ), which will be completed in 2013. The plan will include: 1) a summary of bat biology and threats, 2) species accounts for all 15 species of bats living in the state, and 3) strategies and tasks for conserving bats in Washington, including Keen’s myotis. Partners and cooperators: U.S. Fish and Wildlife Service, U.S. Forest Service, Bureau of Land Management, Oregon Department of Fish and Wildlife. Boland, J. L., J. P. Hayes, W. P. Smith, and M. M. Huso. 2009b. Selection of day-roosts by Keen’s myotis (Myotis keenii) at multiple spatial scales. Journal of Mammalogy 90:222-234. Boland, J. L., W. P. Smith, and J. P. Hayes. 2009a. Survey of bats in southeast Alaska with emphasis on Keen’s myotis (Myotis keenii). Northwest Science 83:169-179. Firman, M., M. Getty, and R. M. R. Barclay. 1993. Status of Keen’s long-eared Myotis in British Columbia. British Columbia Ministry of Environment, Lands and Parks Wildlife Working Report WR-59. Hayes, G., and G. J. Wiles. In prep. Bat conservation plan. Washington Department of Fish and Wildlife, Olympia, Washington. NatureServe. 2009. NatureServe explorer: an online encyclopedia of life [web application]. Version 7.0. NatureServe, Arlington, Virginia. <http://www.natureserve.org/explorer>.